The Clear Sky Cafe on Clearwater Beach is great for locals and those on a Florida beaches vacation. Make this a place to eat and recharge in Clearwater FL. Clear Sky is fast becoming one of our favorite places to relax for breakfast on a lazy weekend morning...or head over to for Happy Hour any night we are checking out the fun at Pier 60. We had breakfast here early Sunday morning, but were surprised to see the outside seating filling up. The Clear Sky Beachside Cafe (official name) is under new management. The breakfast menu starts with a basic Two-Egg Breakfast (for only $4.50), then gets carried away with five different styles of Egg Benedict including the "Sardou Bennie" and the "Nova Scotia Bennie." There are also Huevos Rancheros, Belgian Waffles, plus both Java and Almond French toast and thirteen styles of omlettes. A Kiddie Breakfast is available for those 10 and under...at only $4.25. *You can get Mimosas and Bloody Marys with your breakfast. The Cafe has a full liquor license. Located at 490 Mandalay Street, the main drag on Clearwater Beach, it has a bright blue front on the beach side of the road...right next door to the new Sandpearl Resort. Breakfast is served seven days a week from 8 a.m. to 11:30 p.m. on weekdays. On weekends and holidays, they open an hour earlier and keep breakfast going later. The hours are from 7 a.m. to 1 p.m. Although the Breakfast Menu is extensive...it is NOT expensive. Almost every item is under $10...and you receive generous portions. We ordered the "Stuffed Burrito Grande" for $7.95...and split it. We were stuffed when we finished. From what our waitress told us, the name "Clear Sky" was chosen to provide a beach theme, coupled with a sense of calmness...like in the old time sailor's idea of "clear skies, smooth sailing." They sure got that right. You are living the Florida beach lifestyle when you choose to eat here. There is free parking in the lot of the little strip shopping center where the cafe is located. Plus, metered parking along the curb. The outside patio has 12 tables. They get filled up quickly on beautiful Florida beach mornings and people enjoy lingering. 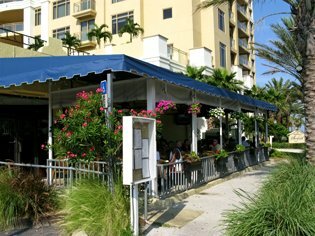 Since the cafe is only about a hundred yards from access to Clearwater Beach, a nice sea breeze flows through the breakfast area. We always try to get the farthest table away from Mandalay Avenue. There is not overwhelming noise before 10:00am, but we just enjoy eating as close to the beach as possible and the far table has the best view. 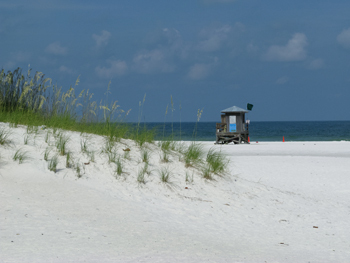 Proximity to the beautiful sugary white sand of Clearwater Beach makes this place even more attractive. In addition to their excellent breakfast, the Cafe also has a fine menu for lunch and dinner. Brick oven gourmet pizza, Tapas-style appetizers and salads with Caribbean or Asian flavoring are popular here. The Cafe has a full bar and Happy Hour runs from 3:00pm to 7:00pm. On weekends, there is live entertainment outside on the patio. 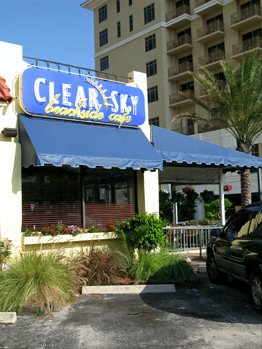 Make sure you stop in to the Clear Sky Cafe on your next visit to Clearwater FL. What are the different Clearwater Florida beaches?